Are you starting college this fall? This post is for you! It’s full of practical advice and insider info from Rachel Tripp of Winchester, Virginia. Rachel graduated from the University of Virginia in 2014. NOT helpful: naps. They made me feel even more tired throughout the day. I averaged around 5 hours of sleep in my first semester and it caught up with me. I need at least 6 solid hours of sleep to function normally and not feel groggy throughout the day. Get enough sleep! Meeting new people when and where you can is fun, but it’s also important to intentionally make 3-4 friends that are close to you and that you can get along with. That way you can begin to make deep relationships (that you could live with next year) rather than a width of friendships where you feel lost as to who to hang out with. And I also learned that it is OKAY to take time away from people. The common term of FOMO "fear of missing out" is so true! My first year I was so afraid to be alone ever, and always had this anxious feeling that I was missing out on something. As a result I did not get good sleep and found myself competing in how many people or friends I knew. Too many friendships that you try to deepen can wear you out! In an hour or so by yourself from time to time do something simply for the pleasure of it. That can be playing around on a guitar, drawing or crafts, or taking a run/walk around grounds. Take time to do something simply because you want to! Get creative with where you study. I enjoyed my first year trying out all the amazing scenery and fun nooks and crannies to study in! Sometimes I would study by the Tennis Courts if I was by Memorial Gym. Sometimes I would study in the Amphitheater, a place conveniently located near the Dumplings truck! Sometimes I would study in first floor Clemons or stacks of Alderman. There are also the gardens by the Rotunda, benches by the Dell, and so many more fun places to study. This can make homework a little more exciting by mixing up the location and bringing a friend along if you enjoying studying with others! As far as grades and classes go, establish your routine of how you take notes as early as you can. Try out different techniques. Some people record notes or write down everything either on paper or computer. If you record notes this can allow you to simply listen if that works for you. Handwriting notes worked best for me, to also be able to make diagrams or draw out the concept. I would get too distracted by my computer and the temptation to go on other sites like facebook. In my first semester I would sit in the back and as a result fell asleep in many of those classes. In order to really pay attention and not get distracted sitting up closer really does help! Even sitting behind someone on facebook can be highly distracting, and has been proven by research to distract other students to the point of really hurting their grades! Also going to class with friends that you sit by that want to go to class is important. I went with a friend that would want to skip the majority of the time, as a result I skipped that class more and did not do as well as I could have. Study groups worked very well for me. I never did or needed them in high school, but they are highly helpful in college. I would study on my own first and then study in a group. With a group study, you can clarify confusing concepts from a class and double check any notes that you missed if the teacher talked too fast. Amidst all this studying and learning, there will be many many fantastic clubs and groups to join. You will probably sign up for every other group that sounds highly interesting to you. What I did was sign up for a wide variety of groups to 'trial and error' where I could fit in. Ultimately, however, you may find that a maximum of 3 clubs is more than enough. For me, I picked one main organization that I really wanted to devote my time and heart to: Chi Alpha. I had tried University Dance Club, Nursing Student Without Borders, Oluponya Records, International Justice Mission, and Abundant Life. Eventually however I have limited myself to Chi Alpha and International Justice Mission, so that I can enjoy other various social/active opportunities at UVA. Plan fun breaks or spontaneous ones with friends as you venture the grounds of UVA. Grab a group of friends to check out Observatory Hill, go to the Corner together, buy groceries from Barracks together, or go to a football game! Once we went out at 2am just to throw a glow-in-the-dark frisbee. It is so easy to find or grab people to come with you on an adventure if you have an idea! Along with fun group hangouts, it also makes it fun to invite other halls or floors to make for co-ed hangouts! We would try to do weekly dinners with some girls in our hall and some of the boys on the floor below us! It is so important to see the game group of people at least on a weekly basis in some form to help make you feel connected! Peer pressure does exist! I learned this from 'trial and error', I found myself doing things I never thought I would do. Streaking the lawn was fun, but hangovers from alcohol was not so much! It was so important for me to make friendships outside of the party scene, because that is where you can have a relationship based on more than enjoyment of alcohol. If you think 'everyone' is doing it, think again and try out meeting a different group of people if you find your current friends pushing you in a direction that you don't want to go. If you do decide to go out, be sure that the person you go with can be trusted to stick together. Several times I would be left alone, and learn the hard way that some people can abandon you at a party. Trying to find your way back when you don't know where you're going is not fun! Have a phone number of an upper classman that you know very well that has a car, so you can call them if anything happens! Have a fantastic first year at college! College is an amazing time to approach "identity." What are you going to identify yourself with? Who are you going to identify yourself with? What hard choices are you going to make? It's not something that's supposed to feel condemning, and you don't want to live under excessive pressure, but the decisions you make during your college years (and then on during your twenties) will have huge ramifications for your life. But that should come as no surprise-- habits you form today will determine what you're doing tomorrow, the character you form, and the destiny you walk into. Having said that, college is a great time to make mistakes-- don't avoid them. I did too much of that. Take classes you wouldn't normally think to take. Hang out with many diverse groups. Become friends with people you wouldn't gravitate to first. Live adventurously. Do enough preparation to allow yourself sweet spontaneity. Know that you will have an amazing time at this great institution, but life doesn't end there, and in fact there is much more "living the dream" to be had afterwards. Let UVa be a launching pad. Let God god-size your dreams. SEEKING INCOMING UVa STUDENTS! Share the love! We love to WELCOME the new Hoos to the Bonhoeffer House---a warm home away from home in Charlottesville--at the intersection of faith, thought & life. or FILL OUT THIS FORM NOW. We'll send a hand written note before they even get here! We'll keep the invitations coming--for 4 years! It seems like the summer just got underway, but soon, Charlottesville will again be bustling with students new and old. Come August, you will move into your new dorm home, you will meet all kinds of people with different stories, and you will experience new things. To some, this whirl of activity is exciting, while others find it unsettling and exhausting. For many Christians, the start of college is a time to think about their faith, what it means, and how it intersects with their academic and social lives. At college your faith will be challenged differently than in past years. You will ask harder questions. You might even face doubt at times. Theological Horizons serves the academic community by providing a welcoming place for engaging faith, thought and life. As a student, the Bonhoeffer House quickly became a place for me to rest in the midst of an otherwise busy week and to think about what it means to live the Christ-centered life. I came to Vintage lunches on Fridays, in part to eat a delicious home cooked meal, but also, and perhaps more significantly, to feed on the wisdom and experience of Christian thinkers who came before me, who asked the hard questions and who fought to think well. We serve a God who hears us in our sadness and in our joy. The readings at Vintage were a reminder of how God speaks and works both in my life and in the lives of so many people before me in all seasons. Think C.S. Lewis, Jean Vanier, St. Benedict, and Frederica Mathews-Greene. You will get the chance to know them too. Their stories will encourage and impact you—telling you of the amazing and certainly real ways our God can work and speak. Their stories will remind you that you are not alone. The questions that might plague you now, have likely been asked before. Should you decide to come (and I hope you do), you will learn from fellow students, but also people who lived and thought long before our time. As a recent graduate, I thank God for the gift that Theological Horizons was to me. So please, come August, whether you are an incoming first year or not, make plans to visit Vintage, attend Evening Prayer on the Lawn, or participate in any one of the programs that Theological Horizons hosts at the Bonhoeffer House and around town. Email Karen at info@theologicalhorizons.org and she'll put you on the invite list--then you won't miss anything!! Calling is a complex and comprehensive word that speaks to how we faithfully steward all of life, yet we often tend to think of calling as primarily to do with our giftedness or potential. And while both are good and important, this view misses some of the more sustaining and redemptive aspects of calling which are borne of brokenness, finitude and frustration. Please listen to this unique discussion about vocation and be encouraged to see how even constraints and limitations can yield purpose in life and work. Kate Harris is the author of Wonder Woman: Navigating the Challenges of Motherhood, Career, and Identity as part of the Barna Group Frames. She was the Executive Director of The Washington Institute for Faith, Vocation & Culture from 2011-2015 and the interim Executive Director of the Fellows Initiative from 2016-2017. Kate graduated from the University of Colorado at Boulder with a B.S. in Journalism and B.A in Political Science and is currently pursuing an MA in Culture Studies at George Mason University. She is wife to a very good man and mother to four young children and also a new board member of Theological Horizons! Welcome, Kate! Listen to "Faith in the University"
What does a Christian need to know about faith in the university? What are the intellectual challenges to belief and the day to day realities in the classroom? In this one hour talk, religious studies professor Charles Marsh speaks in depth about thinking and living as a person of faith in an academic context. With an introduction by Billy Peebles, headmaster of Lovett School in Atlanta. Listen to psychologist Susan Cunningham speak on two things she wish she'd known when she was nineteen! 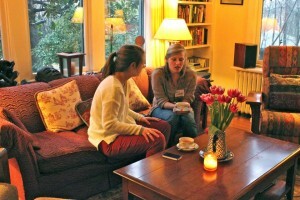 On Tuesday afternoon, girls gathered at the Bonhoeffer House for the annual “Beat the Rush” tea. The day was a dreary and rainy one, and the first year girls were tired from two long days of rush. However, the hot tea and delicious cookies, cheese, and fruit brightened up the day. After chatting around the table of appetizers, the students gathered in the living room for the talk. Karen introduced the panel of women who had come to offer wisdom and insight to the students. Among them was Susan Cunningham, a well-known counselor in Charlottesville. The four other ladies there were Molly McFarland, Tilly Lazar, Johanna Montague, and Kendall Cox. After introductions, we first had the privilege of listening to Susan Cunningham. She told us two pieces of advice she would tell her nineteen-year old self. The first piece of advice Susan had to offer was to “never compare yourself.” One quote of Susan’s that particularly stuck out to me was that “comparison is the thief of joy”. By comparing ourselves to those around us, we either feel a sense of superiority or inferiority. In both instances, we experience a loss of joy, pleasure, and satisfaction. We have to actively avoid falling into the temptation of comparing, which we as humans (and especially girls) will always face. Susan reminded us that we are all uniquely and perfectly made, with different passions and personalities. After Susan spoke, the other four ladies then related their own experiences with rush and sorority life—both the challenges and the blessings of it. It was a neat opportunity to hear from these ladies; their experiences were still recent enough to be relatable, yet the women were also old enough to have reflected and gained insight on their college experiences. After, the first year girls were then able to ask questions about difficult issues, such as dealing with disappointment and pressure from others. CLICK HERE to watch the video of the lecture. Philip Yancey has explored the most basic questions and deepest mysteries of the Christian faith, taking millions of readers with him. Early on he crafted best-selling books such as Disappointment with God and Where is God When it Hurts? while also editing The Student Bible. He has felt the freedom to explore central issues of the Christian faith, penning award-winning titles such as The Jesus I Never Knew, What’s So Amazing About Grace? and Prayer: Does It Make Any Difference? His books have garnered 13 Gold Medallion Awards from Christian publishers and booksellers. He currently has more than 15 million books in print, published in 35 languages worldwide. The Capps Lectures are co-sponsored by Theological Horizons and the Project on Lived Theology at UVa. For more information, contact us at info@theologicalhorizons.org. LEARN MORE! Go to our Capps Lectures in Christian Theology. Philip Yancey: "Two Themes That Haunt Me: Suffering & Grace" 2015 Capps Lecture at the University of Virginia from Theological Horizons on Vimeo. Explore the beauty of God this summer! We will reflect upon the subtle yet surprising ways God teaches us to see anew through the arts. With readings from Mark Jarman, Dana Gioia, Li-Young Lee, Denise Levertov, David Kirby, Emily Dickinson, Flannery O'Connor, Edna St. Vincent Millay, John Donne, Richard Wilbur, Gerard Manley Hopkins and Emily Brunner. Led by William Boyce, doctoral student in religious studies at UVa. Hosted by Westminster Presbyterian Church. Sunday evenings from 8-9 pm at Common Grounds (corner of Rugby Rd & Gordon Ave., one block from Beta Bridge). ALL ARE WELCOME. No advance preparation is necessary. “The quest of beauty reminds us of our final destiny, it sets us back on our path, [and] fills us with new hope.” (Pope Benedict XVI to a gathering of artists at the Sistine Chapel.) As Christians, we need more than rigorous teaching and sound philosophy--but our teaching and understanding must always be a witness to the beauty of God and His creation. The Good. The True. And the Beautiful. Together, these transcendentals help us to understand the scope of Christ’s cosmic declaration as “the Way, the Truth, and the Life” (Jn 14:6). We should hardly be surprised to discover, then, an enduring admiration for authors like C.S. Lewis, J.R.R. Tolkien, Flannery O’Connor, Marilynne Robinson, John Updike, and Fyodor Dostoevsky—to name a few—who blend these elements in powerful yet sublime ways. This summer, Theological Horizons has welcomed students and members of the community to join our quest of beauty, or what we called, “Wondermentality.” By partnering with Westminster Presbyterian Church, we have been able to host intimate conversations in a “coffee-shop-esque” setting on matters of faith, art, and wonder. As a six-week series, without any prerequisites or preparations required, we reflect each Sunday through artistic works on the “big” questions of doubt, desire, hope, discouragement, friendship, apathy, longing, joy, and purpose. We have discussed theologians (Emil Brunner, Martin Luther, Dietrich Bonhoeffer), novelists (Flannery O’Connor, Ernest Hemingway), poets (John Donne, Gerard Manley Hopkins, Emily Dickinson, Mark Jarman, Li-Young Lee, and Denise Levertov), and everything in between, from playwrights and painters to stained-glass artists and architects. Good art leads us to ask important questions, and while it is by no means the preserve of Christianity, it is something Christianity cares about deeply. If Emil Brunner is right that “Art is always the child of the longing for something else,” then art is a kind of redemption that points to the ultimate redemption of God in Christ. Although the summer is a challenging time for campus ministries, we have had tremendous enthusiasm for this series on the arts—with a few students attending who have no or loose religious affiliation. We have had UVA professors, local teachers, recent alumni, and whole families participate. Some conversations have lasted well past the end of our formal discussion and into the late evening. In all, “Wondermentality” has been an exciting opportunity to consider what T.S. Eliot regarded as the “intersection of the timeless/With time.” Your faithfulness in prayer and your contributions of all kinds to Theological Horizons have made this summer a fruitful time of ministry. Without your continued support, we certainly would not have seen so many wonderful conversations started, connections made, big questions pondered, or wounds redressed. In the words of Paul, thank you for being “co-workers in God’s service” (1 Corin. 3:9). An address given to the class of 2015 of the Covenant School of Charlottesville by Karen Wright Marsh, Executive Director of Theological Horizons. May 30, 2015 Good morning, friends: families, faculty and administration—and a very good morning to you, Covenant School Class of 2015! It is a tremendous honor to be with you on this happy occasion and to be a part of the Covenant community for a day I’ll always remember. Graduates, while you labored over your senior theses this spring—and I know they all turned out to be brilliant papers—I had a research project of my very own. Ever since Mr. Sanker invited me to speak back in the early spring—I’ve been studying hard and I’ve learned a great deal about graduation speeches. I went online, where I found copies of “The Greatest Commencement Addresses of All Time” and “Ten Hilarious Graduation Speeches That Won’t Put You to Sleep.” Two weeks ago my son, Will, graduated from the College of William and Mary. I was so busy taking notes on Condaleeza Rice’s speech that I almost missed seeing Will get his diploma. This in depth research has led me to one essential conclusion: Every speech must have one joke—at least one. So let’s put that joke out there right now. Are you ready? Want to hear my backup joke? Could you begin to count the times you have made this drive—the mornings you’ve come around on Hickory Street and caught that view of green grass and white columns? If you’ve been at Covenant since 7th grade, you’ve taken the path to and from school well over 2000 times. Parents who dropped off and picked you up, they can double those numbers! Over your years here, other paths around Covenant School became familiar. You knew the schedules and school policies. You rocked the uniform. You figured out your teachers’ expectations, the best ways to bank community service hours. You cheered for your House and led the younger kids in the ways of Wisdom, Courage, Temperance or Justice (I will show no partiality in this matter). In chapel you heard, week after week, messages grounded in gospel truths—messages about why you were here: to follow Christ’s example and to discover God’s truth in all the things you were studying. As you grew in friendships, you learned who really would support, care, and comfort you when times got tough—and who would celebrate with you when you got a college admission letter or a soccer win. I hope that you found joyful freedom within the limitations and structure of this well worn territory. Familiar paths can get old, I know that. You may be tired of the same view, the same faces. Well, today marks your commencement from Covenant. This word “commencement” means a beginning, a new start. And that it is what it is. When you pull out onto Hickory Street this afternoon, you’ll be travelling onto new roads. On the other side of summer you’ll begin college, a job or a gap year. Let’s take a moment to imagine that that sweltering day in late August when you’ll step out into life at the crossroads. Your family will drop you off with your pile of stuff from Bed, Bath and Beyond—your clothes hamper, desk lamp, an iron you’ll never use. They’ll head back home to your old street and leave you there, surrounded by strangers still unpacking their minivans. Picture yourself standing there in front of your dorm, by yourself…You’ll look up the street. You’ll look down the street. You’ll see sidewalks that head across campus, to places you’ve never been. It will be an awkward, exciting, terrifying, exhilarating, lonely moment-- when you stand alone. And you’ll wonder: Which way now? As a young traveler—someone who’s left family and the stability of the life at Covenant—this verse can be a guide, a compass for you. The beliefs you may have taken for granted at this Christian school will be challenged in a big way. In the classroom you’ll wrestle with unfamiliar ideas and professors you don’t know.You’ll face tricky social dynamics on Friday nights down fraternity row. You’ll live with folks who come from different religious and moral and ethical points of view. You will have some hard shipwreck experiences along the way. Some things that have held your world together will unravel. Maybe it’ll be the loss of a romantic relationship, maybe a physical injury or illness, an academic or personal failure; perhaps you’ll discover intellectual concepts that conflict with what you’ve assumed to be true—things that you’ve been taught here at Covenant. Truths that seem clear to you today will be shaken. In the coming you’ll push off from the safe dock of the beliefs you’ve always held. You will be challenged to think critically about God about the world— about yourself. This is a right and necessary process. It is your work of growing up—to become the one God has created you to be, on your own, as an adult. Notice the wisdom here. Stand at the crossroads—Stand, don’t run. At that crazy 6 way intersection, don’t just run down one path in a panic——or chase after the kid who’s already a few steps ahead of you. Stop and stand. This is the time to think, to be smart, to wonder about the person you want to become—and how you’ll get there. Take a deep breath. Pray. Remember God’s close presence with you. As you stand at the crossroads, Look—yes, there are many unknowns. You’ll choose friends, classes, academic majors. You’ll try out for teams, you might go through Greek rush, you’ll probably choose clubs & fellowship groups. But watch out for the smaller decisions you’ll make—the twists and turns in the course of a day. Will you leave your Bible out on the desk in your dorm room or will you stash it in the drawer? When you go into the dining hall, will you sit with the people you know or will you seek out the girl who’s sitting by herself? If someone hands you a beer, will you take it? Will you catch the van to church or will you sleep in this once? Look. Open your eyes to discern where these daily choices might take you. You will make choices that you regret—and that’s ok. Some roads will lead to unexpected places. There at the crossroads, stop and look, be aware that the small turns do set the course for your very long hike—even though you don’t know your destination. Ask for the ancient paths. Ask where the good way is. What are these ancient paths? I’m not going to claim that just because something is old and traditional it’s better; I wouldn’t take back my iphone 4 for anything. You studied enough history to know that uncritical nostalgia about times past can get you into big trouble. And I’m guessing that when you start on your fabulous new adventures in the fall, you’ll be ready to explore some completely new turf. You won’t be making a U turn back here Fifth Street Extended. God is all about creating new things, about enlarging your boundaries and taking you past the edges of where you’re comfortable. God wants to you to grow. So let’s go to Scripture for clues about these old paths. Proverbs 12:28 says, “In the way of righteousness there is life; along that path is immortality. These ancient paths of righteousness are given to you out of God’s marvelous love and mercy. Psalm 107 promises when you’re lost and desperate and call out to God, God will rescue you. God will your feet on a wonderful road—a path that takes you straight to good places. Jesus himself declares "I am the way" and he‘s already told us what to do: take the narrow way! Jeremiah tells you to Ask where the good way is. When you’re at a confusing, crossroads moment—well, that’s a really good time to seek advice. Look to the people whom you admire, people that you want to be like. If you can’t text them from the intersection, just Ask yourself: Which path would they take? Across the centuries, many of your older brothers and sisters in the faith have called out to God for help. If you’re at the University of Virginia, come to the Bonhoeffer House for lunch with me on Fridays as we explore Vintage readings. There’s so much amazing wisdom in lives of faithful Christians who have been this way before. Christ followers have marked the trail for you already. It’s a good way that will bring you Joy and life. So there’s no need to go stumbling into the thorny bushes on your own just to blaze a trail. Check out the old maps. Remember all you’ve learned here at Covenant. You are headed out there with the rare gift of a Christian worldview, an understanding of the universe and your place in it –where you are a loved child of God. Maps don’t do much good in the bottom of your backpack. Take the truths you know in your head. Consider the counsel of mentors & friends—and then go live it out. Walk in it—every day. Practice the Spiritual, relational, even academic habits that keep you moving along the good old road. It takes time to build habits. You’ll get there by walking every day, not running. And then find companions and mentors who will hike along with you, who want to follow in the way of Jesus, too. In a world of anxiety, fear, perfectionism, pressure, you can find rest—You can have the assurance that you are headed in the right direction, in God’s hand, on a path that’s been worn down by travelers before you. In the coming years, will you ask for the ancient paths? And if you find the good way, will you walk in it? Will you find rest for your soul? I pray that you will walk in the confidence and hope of Christ. That you will have courage to live and learn boldly. And remember that the roads to Covenant School will still be here; you know the way to Hickory Street by now. May the peace ofJesus Christ go with you : wherever he may send you; may he guide you through the wilderness : protect you through the storm; may he bring you home rejoicing : at the wonders he has shown you; may he bring you home rejoicing : once again into our doors. Amen. With graduation just behind us, we move from the safety and security of a place that we have made home over the course of four years to a time of transition and many unknowns. New jobs, new cities, new financial concerns, new friends, and many other aspects of this period of change, although very exciting, also seem daunting and overwhelming. Saying goodbye to the family we have made here at UVa is not easy. Although I know that many wonderful things are in front of me, I am not a big fan of transition periods. In light of this, I find great comfort in the words of Joshua 1:9, which reads, “Have I not commanded you? Be strong and courageous. Do not be afraid; do not be discouraged, for the Lord your God will be with you wherever you go.” God promises a relationship in which He never leaves us by ourselves. This promise is unconditional; God doesn’t say that He is only with us when we are worshipping Him or reaching out to Him. He is always by our side, even if we stray from Him, reject Him, or don’t love Him. Nothing that we do can make Him leave us or love us any less. This knowledge provides me with the comfort that I never have to rely solely on my own abilities to take on whatever challenge comes my way. If I did, my life would be defined by defeat after defeat. There is just no way that I could face the hard times by myself. Because of the grace of God, He is constantly there to be our rock when our own strength and courage fail us. I find great relief in the fact that I will not be facing this time of great change alone. Frances Grimball ’15, was a Horizons Fellow in 2014-2015 and is about to get married and start dental school at VCU! It’s pretty undeniable—the Bonhoeffer House is a cool place to be around. Throughout the end of my undergrad career, I fell in love with the way that Theological Horizons bridges the gap between the academy and faith communities that surround the University. I was looking for a place that I could come to with my faith tradition and ask questions and be skeptical. The Bonhoeffer House became that sacred space for me. First, I was paired with a mentor. Enter the lovely Kendall Cox: feminist theologian, university adjunct, and New City Arts artist! Kendall and I have shared incredible afternoons sipping Matcha tea (think antioxidants + fighting cancer + boosting metabolism all in one tasty cup!) and discussing the empowerment of marginalized groups like women in the church. I’m really thankful for the way that I was paired with a mentor who wrestles with the same types of questions as me. I’ve also gotten to join in dinner discussions with all the Fellows. Once a month we meet up, share a meal, and discuss Scripture together. It’s a great experience because we represent many different fellowships around Grounds. Throughout the year, we’ve gotten closer and formed friendships. We’ve come together to celebrate and pray for one another in big life endeavors, ranging from marathons to mission trips in North Korea. We’re definitely an ambitious bunch. Finally, being a Fellow has enabled me to participate in the behind-the-scenes operations of the Bonhoeffer House. I literally met the band! In the fall, the Bonhoeffer House hosted a house concert with Lowland Hum, artists-in-residence in Charlottesville. I helped set up chairs and got to talk to singer-songwriters Lauren and Daniel about their vocation. All in all, being a Fellow has given me the opportunity to fully become part of a community that thinks, prays, and serves together. It’s been a wonderful year! Kaylee Lucas is an M.S. Commerce student from Richmond, VA. She studied Religious Studies in my undergraduate career at UVA and spent a lot of time at the Bonhoeffer House. Last summer, she traveled to Kenya and worked at a microfinance loan hub. Kaylee hopes to integrate a concern for human flourishing with her practical business skills from the Comm school. Personal Finance Made Simple - A Flash Seminar With Karen Bonding, CFA Before you Graduate! Get the basics of personal finance in this one hour flash seminar with UVA Commerce School professor Karin Bonding. Most people shy away from financial literacy, but it is not nearly as complicated as you think! Karin Bonding formerly taught finance in UVa's McIntire School of Commerce. Ms. Bonding has worked as an investment professional in the areas of investment consulting, investment analysis, portfolio management, large pension funds, and marketing of investment services. She has organized investment conferences, developed short and long courses for novices and industry professionals, and conducted investment workshops at a variety of corporations. She was a Visiting Professor at the China Europe International Business School in Shanghai, China. She now focuses mainly on personal finance areas such as planning and advisory work and serves on the boards of directors of The Endowment Fund, Salient Alternative Strategies Fund, and other Salient Partners closed-end and open-end mutual funds. Liked this lecture? See others like it here! Fourth-year of college brings quite the interesting series of dilemmas. We seek jobs, degrees, friends, companions, roommates, apartments, and of course, the perfect ending to a college experience. What many fourth-years may not consider is who might be seeking us. What is God seeking for us as we depart from our undergraduate lives? Our tender, early-twenties hearts ache for a clear calling. Through my experience with Theological Horizon’s Fellows program, I lent my ear to God and learned to eagerly and patiently await my calling - my vocation. Throughout the program I was struck by many little kernels of wisdom from the great leaders that surround the Theological Horizons community. The Lord sent a true messenger in my mentor, Evan Hansen. Over coffee, Evan spoke of his life, his vocation, and his love for his wife and his dearest daughter. Evan’s message to me was simple, direct, and so impactful. “Relax”. Evan taught me to take time to breathe and enjoy the splendor of a life filled with The Lord’s love. The fellows program brought another great leader in Michael Guthrie. Michael showed us the true face of Jesus through a study of His parables. Michael’s kernel was one that I will carry with me for many years to come. “As much as the Lord demands to be the center of your life, you must also personally command his one and true place.” Michael brought this axiom into my life through the parable of the sower in the field. Just as the sower “sold it all”, I must remember that everything is “sold” to put God at the center of my life. I most especially want to recognize the leadership and love shown by the program director Christy Yates. Christy, given that she appears the age of most my colleagues, has such a way of relating to a cohort of college kids better than any other leader I have ever been around. However, seeing here with her four children around, she possesses such a gift for showing tenderness, warmth, and affection of or befitting a mother. Christy’s kernel of knowledge wasn't anything she said, it was something she showed time and time again. The purest form of love is servant love. In John 13:34, Jesus gives His disciples a new order or command: "A new commandment I give you, that you love one another, even as I have loved you, that you also love one another.” This statement follows Jesus' washing of the disciples' feet on the occasion of the Last Supper. In washing their feet, Jesus gave the disciples tangible evidence of what love was like. The Greek word that is used here for love is agapao. In the Greek, this verb "to love" is present, active, and imperative. Agape is pure in the heart of Christy. Beyond the time to talk and to pray with one another, Horizon Fellows required us to read intentionally on vocation and to seek a personal mission statement. My statement, after much contemplation is as follows. “Forever clinging to God’s grace and the fruit of the Spirit, I want other’s to feel, genuinely experience and believe that they matter to me, so that they may truly know that they matter to God and to the creation of His Kingdom.” I pray that God will grant me the faith-based adroitness, spiritual humility and invigorating zeal to fulfill this mission. I know that Horizon Fellows had cleared the path and will guide me as I leave UVA this May. Join me in prayer as the program chooses it members for next year. To all such members, dive in and enjoy! Keith Wilson is a fourth-year student from Louisville Kentucky and is studying Leadership and Public Policy at the Batten School. Keith's hobbies range from singing with his a cappella group, brewing a nice pot of tea, playing squash, and artisanal sandwich making/eating. It is his goal to one day own an upscale gas station/convenience store and teach at his alma mater, Trinity High School in Louisville, Kentucky. In an audio interview from the Grounds of the University of Virginia, renowned Christian author Philip Yancey reflects on what it means to be a Christian in college. What are the challenges that university students face? Does faith make any difference? Don't miss Yancey's conversation with Karen Wright Marsh, executive director of Theological Horizons. To listen, click here. As I reflect on the fellows retreat, the concept of hospitality consistently comes to mind. The retreat began on an off-note because of the massive snowstorm, resulting in us being unable to go to the intended retreat center in the beautiful mountains of Virginia. At that moment, the hospitality theme began. We were quickly welcomed into the home of Common Grounds for the entire afternoon and evening to cook, watch movies, and discuss what it means to live life together. The next day, we were warmly welcomed into Karen’s home to have our own Church service and break bread together. It truly was an incredibly tangible experience of hospitality at its finest on the most literal level. On each of those days, we unpacked the idea of loving our neighbors and the way that might look in each one of our lives. We asked questions: What does it mean to live a life of love if we are working at a consulting firm? Can we possibly be doing God’s work if we aren’t in explicit ministry capacities? Can you make money and still love God? How do we choose our jobs based on the community as opposed to the job description? Is that something everyone should do? To what degree should we enter discomfort in our lives after college? What is the value of confession to other believers? What does it mean for us that God really meant it when He said, “It is finished” on the Cross? What does it even look like to love your neighbors? I would like to focus on the final one, loving our neighbors. What a foreign concept in this “look out for number one” culture! But, if I did not know before what loving our neighbors looked like, I really saw it in action in the way each fellow listened to the other articulate his or her thoughts on vocation and calling, and the ultimate call to love everyone as Christ loves us. I really saw it in each person in describing his or her authentic, passionate, relentless desire to seek God’s Will and live a life of love. For some, it looks like entering college ministry. For others, it looks like being a dentist. And others, the corporate world. The list obviously goes on, but the common thread was absolutely clear; each person, in response to his or her call, aims to bring reconciliation across the divisive boundaries created by the world today. This reconciliation will take many forms, but the point is each of us adamantly seeks redemptive relationships while here on earth so as to see the diversity of this world no longer seen as divisive, but rather unifying, the way Christ intended it to be in the beginning. Some of us will take to the streets to protest racial inequality, others will faithfully tend to their patients day in and day out, others will produce literature that forces our society to think about who and whose we are, others will work to create systemic change in our government to prevent human rights abuses, and still more will create music to remind us that beauty exists in the midst of brokenness. In all of these things, we see people being reconciled to each other and ultimately to their Creator as we realize redemption is real, and we are invited to participate in it. 2015 Goodwin Prize competition for graduate students! Through the three annual Goodwin Prizes, with stipends of $2,500, $1,000 and $500, we recognize and reward the most promising graduate theology students in the world. The professor of the $2,500 prize winner receives $500. Visit the Goodwin Prize website page. There you will see submission guidelines, the authors and abstracts of past winning essays and find details on how to submit an essay. For more information, or to receive more postcards or posters to publicize at your institution, email us at goodwinprize@theologicalhorizons.org. On a Friday afternoon this past summer, my friend and I took a leisurely walk through the neighborhoods behind West Main Street. We wove through the streets, picking out houses with colorful doors and imagining what raising a family in this neighborhood would be like. As we were walking, we approached an African American woman standing in the middle of the street, staring intently at a vacant house overgrown with weeds and vines. She struck up a conversation, explaining to us that this was her home in the 1960s. She recalled the games that her siblings played in the backyard and pointed out all of the things that had and had not changed about the property. She then explained the story of her eviction—how her family was uprooted from this home and sent to live in a new housing development. We walked with her through rows of houses hearing the stories of the families who once inhabited them. As we dropped her off at her current home, just streets over, the Spirit prompted us to hold hands and pray together. We embraced and went our separate ways, my friend and I recapping the conversation and discussing how moving this woman’s story had been. It was not until last week’s panel discussion, “Where Do we go from Here? Race and Mutuality in the Wake of Ferguson,” that I realized what a significant encounter this had been for both parties. Last Thursday night, Theological Horizons hosted a panel discussion on Race and Mutuality at Westminster Presbyterian Church. The room was filled with people from different generations—college students, young professionals, and retirees. While most of the attendants were white, it seemed that everyone in the room was eager to learn about how they should live with grace and responsibility toward their neighbors following the events at Ferguson. Second year student and panelist, Aryn Frazier, made note that nothing in society happens in a vacuum. Like Longo said, race relations in Charlottesville are rooted in a history of broken trust and frayed relationships. It is important that we know the context of the racial situation in which we are living so that we may act appropriately and responsibly. I came home from the panel and began researching the story of “Vinegar Hill.” I found that this was the name given to the gentrification project of the 1960s that my summer friend had described to me in vivid detail. Had I missed this opportunity to stop and hear her story, I would never know so intimately what this broken situation entailed. And she may have never known that there are 21-year-old white girls who are eager to listen. As we move forward in the community of Charlottesville following the events that happened in a neighborhood not unlike our own, it is important that we stop to hear the stories of those who are different from us. Thursday’s meeting on Race and Mutuality was a beautiful beginning to an ongoing conversation; and I pray that it will develop into a dialogue that outgrows its predominately white, middle-class group of attendants. Panelist Tracy Howe Wispelwey left us with the question, “Do we belong to one another?” As we move forward in hopes of reconciliation and peace, our community must learn what it means to belong to one another—to carry the burdens of the neighbors we do not yet know. This responsibility rests on people from all neighborhoods—from student dorms on McCormick to the houses on Prospect. In order to live in mutuality, we must take the risk of knowing and being known. Only then may we write for our community a better story. Carly Misenheimer is a fourth year from High Point, North Carolina. She is a Religious Studies Major, and she is writing her Distinguished Majors Thesis on the language of naming God in Feminist Theology. She hopes to attend Divinity School after graduation. She leads Young Life College at UVA, and she enjoys singing, hiking the Blue Ridge Mountains, Cheerwine and spontaneity. In an effort to look with honesty at race relations within our University and surrounding community, we’ve asked a diverse panel to consider: 1)What is our responsibility toward one another in the wake of Ferguson events? 2) How might that look practically in the context of Charlottesville and at UVa? Common Grounds is the white house on the corner of Rugby Rd. and Gordon Ave. Free parking available at Westminster Presbyterian Church, Gordon Ave. and the UVA Culbreth Theater.